So here is the deal- I don't think I have purchased wrapping paper in years (this is probably not a surprise)! I would never, EVER buy any kind of gift wrap when I can make my own so I am always looking for new ways to wrap holiday gifts. 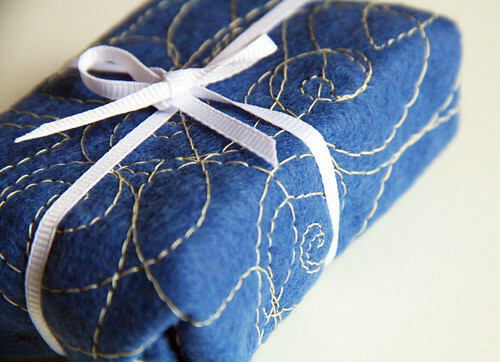 Since sewing has become such a big part of my creative life, I have been experimenting will all kinds of ways to create unique wrapping with stitched surfaces. 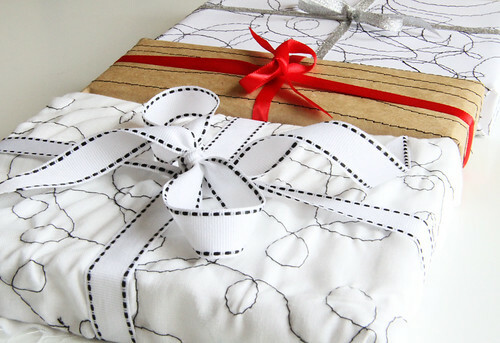 Here are some really easy ways to use stitching in your gift wrapping! 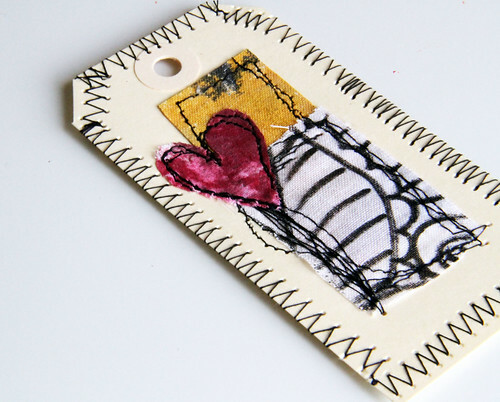 A piece of recycled paper bag makes for a great surface to stitch stripes. 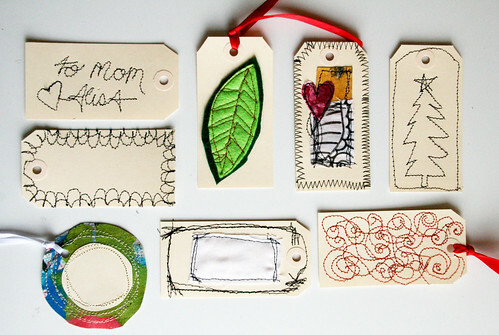 Remember all those ideas for crafting with book pages that I posted a couple weeks ago? 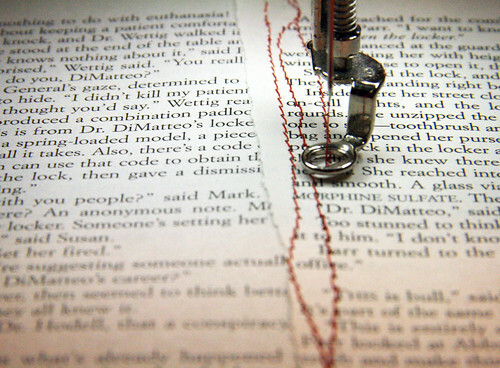 Well you can also sew on recycled book pages. 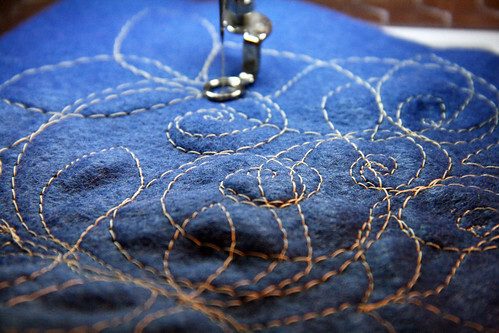 Stitch a few pages together and stitch all over the surface to create texture. 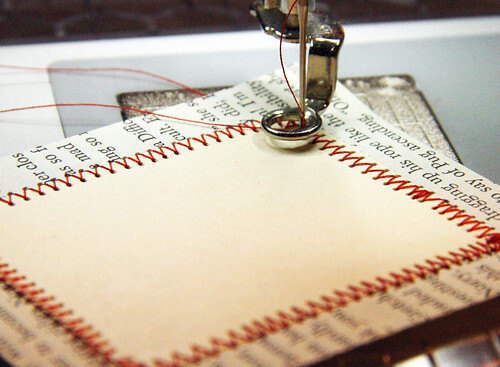 Create a matching card by layering book pages and paper and sewing them together with a zig zag stitch. 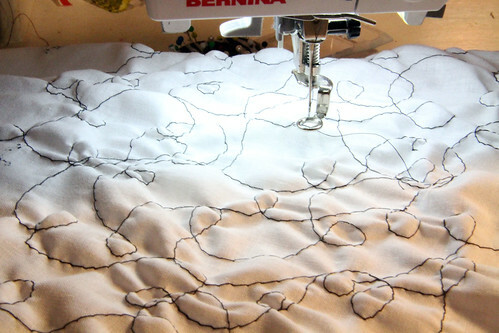 Use fabric (just white muslin) and free motion stitch all over the surface- I created lots of loopy lines. I did not use any interfacing (typically used for stability under the fabric when free motion sewing) because I wanted the fabric to pucker for added texture. 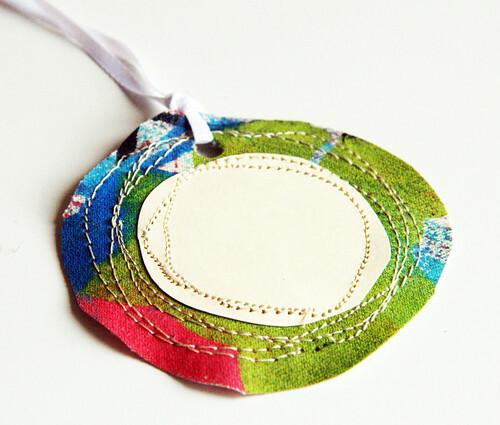 Try stitching on felt- it is colorful and super affordable. 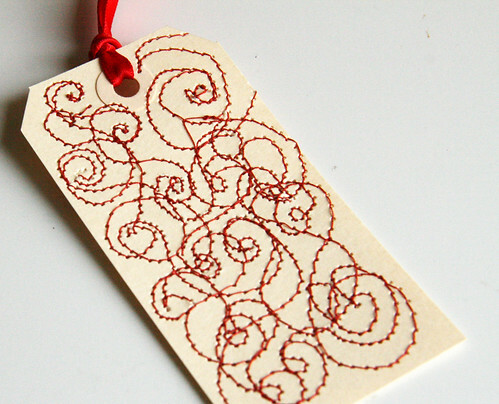 Stitching can also be incorporated into gift tags. 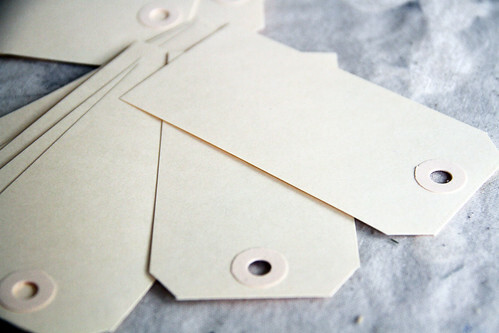 You can purchase a package of tags at office supply stores and transform them into something unique! or even a simple image. 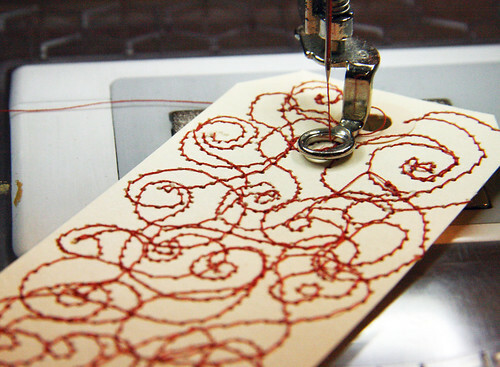 How about filling the surface with a stitched pattern? or create layers with fabric scraps. 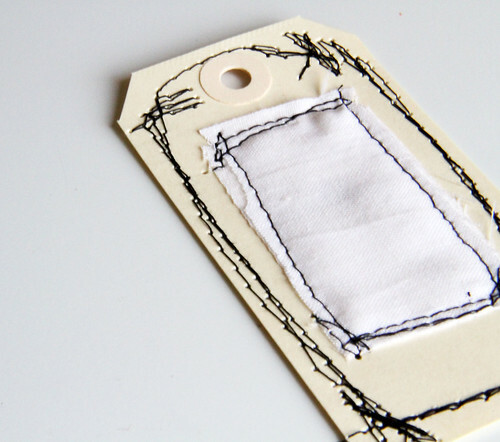 Use scraps fabric or painted canvas and cut out simple shapes to create a unique tag. 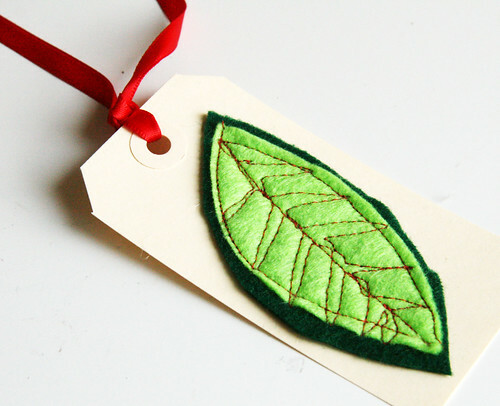 Use felt and stitching to create leaves that can be added to the surface of a tag. 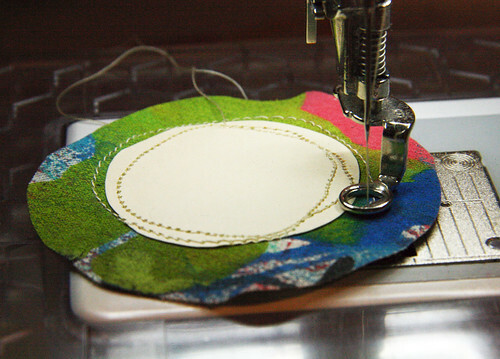 Take it a step farther and create cards full of stitching by layering scraps of fabric stitched to the surface of a paper card. 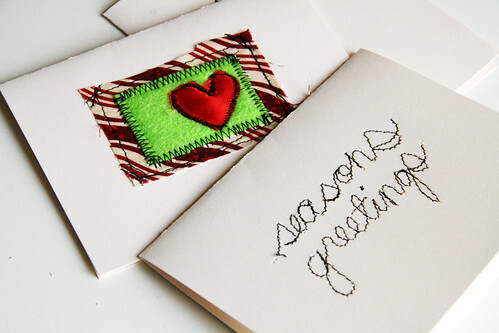 Use free motion stitching and write out a simple greeting. 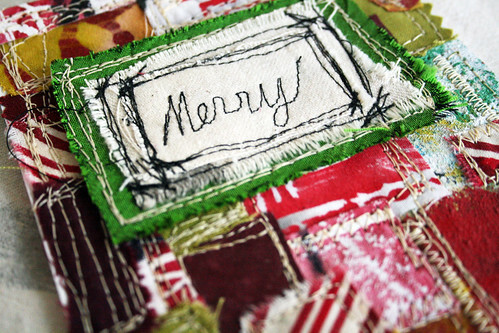 Create cards with lots and LOTS of layers of stitched fabric with a stitched word. Thank you so much for always sharing such great creative projects. Your piece about giving really touched me and has changed my whole outlook about giving. 2011 will be my year for focusing on giving. It is amazing how many things you can do with your sewing machine!Unbelievable!Ariadne from Greece! thank you alisa !! 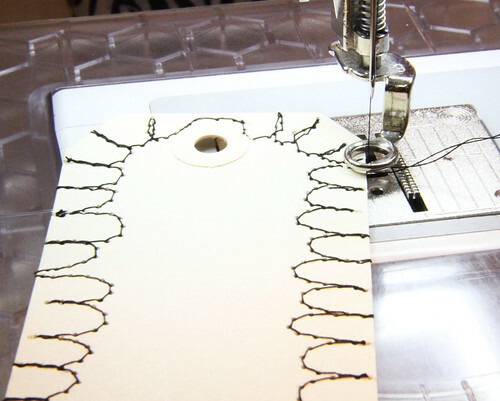 my english is not good but merci pour ta générosité, tes idées sont supers et tu m'a fais découvrir la broderie à la machine, quelle machine utilises tu pour réaliser ces broderies? Love this idea! Gives me another excuse to play around with paper and my sewing machine. These are all awesome...I love the way they turned out...what a great idea...I think I need to get out my machine...!Thanks..! U are such a rock star..
Love your blog...you do such great work. Thanks for your inspiration! amazing!! 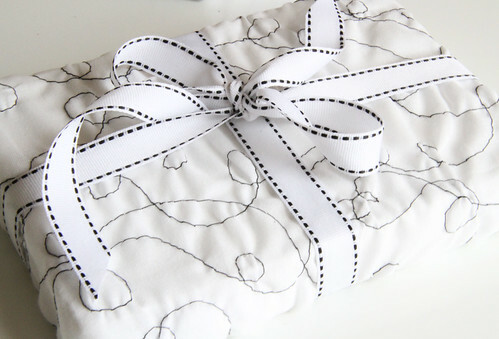 i have one gift ive been waiting to wrap...and this is perfect for my beginnger sewing skills!! LOVE. 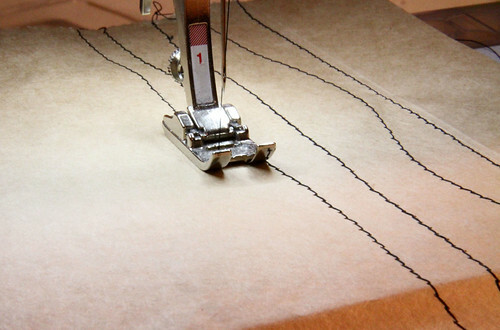 your sewing machine is a real work horse isn't it? 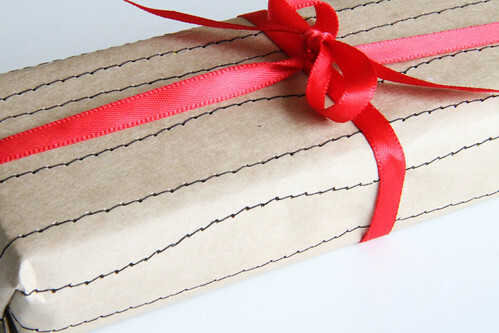 love your wrapping and tagging ideas. Very inspiring! 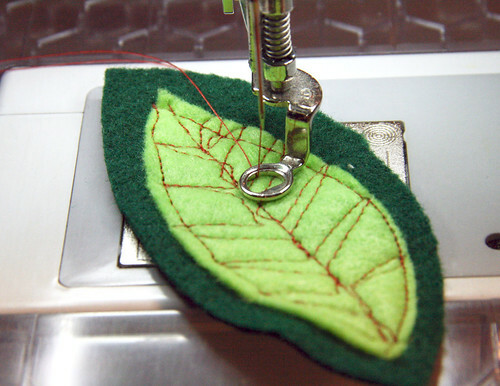 BTW I also sew a lot so let me invite everybody to my blog about sewing. you are such an inspiring woman! How fun..... you always have the best ideas and photos. What a generous person you are. Wow! Love, love love!!! All of it! Thank you so much for sharing. Happy Holidays Alisa! They are wonderful, all those stitched things. Thank you so much for making them, loving them, posting them. I really want to combine this with the bag idea. 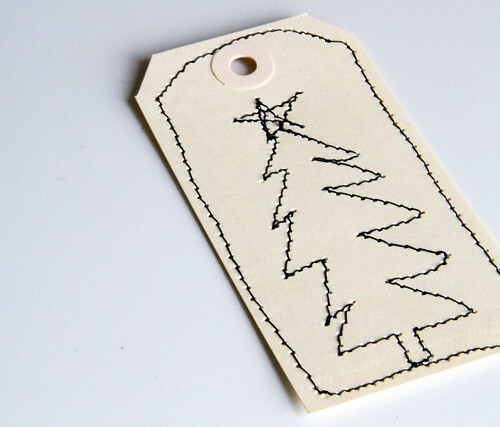 Start by free motion embroidery on the felt or muslin & then make a simple bag to 'wrap' the present. Thanks so much for the inspiration. I won't need to find Christmas fabric, I can 'make' my own. My head just blew up. Your ideas are just wonderful and gorgeous. I Wish I would have 48 hours a day. At least the little hangers I will try. this is too cool! is that what an embroidery machine looks like? or is it just the foot? awesomeness!! I'm curious about the foot, too. Is that the machine or a special foot? 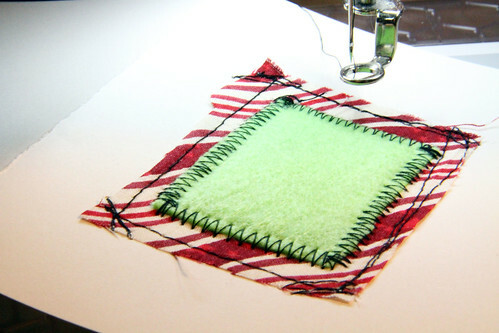 I tried doing this and my thread broke every few stitches. I changed out the thread to something stronger, but it didn't help. What am I doing wrong? The felt has an especially nice texture. I do love those ideas, thank you for sharing! where do u get all these great ideas from? what a creative mind you have! HI there, I am new to your blog and have been scrolling through a few pages of posts. You are on talented lady! I will be following along. Thanks for the inspiration! I do really adore stitching and creating and yours are beautiful things. Really Nice gift idea. Its an innovative post nice hand work. i do not know what to say......but i want to tell you that your articles really capture my eyes! Amazing - look at all this eye candy! I think my readers will really enjoy these ideas. Thanks again for sharing! !...and for your beautiful blog. It's 2:30 am in Portugal and I'm still travelling in your blog! Congratulations on your natural gift! 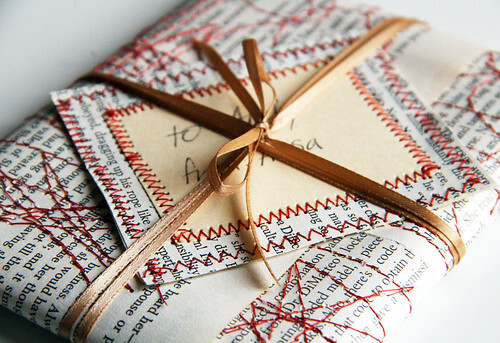 like the idea of gift wrap...I appreciate it. I appreciate your idea of wrapping and tagging..... of gift. Its an awesome art of creation i loved your blog art.